We have a spangly new website! Come on over to http://rollerbillies.com and see all our new shizzle. Goodness, is that the time already? We should probably get a bout or two in before the end of the world. And bake some macaroons. Countdown to the Apocalypse starts on Saturday August 6th with Quadrophobia, when we play the unbeaten (we don’t do things by halves) Brighton Rockers Roller Derby. Awesome! Their pants are fancy and they fight giant killer squid before breakfast, so we are more than a little excited and very pleased to be asked to skate against them. 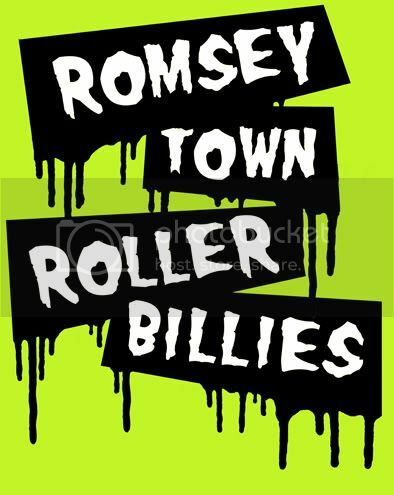 We shall also be running the traditional Rollerbillies Injury Sweepstake as soon as the team is announced, first prize as always being a Jägerbomb and a ride on a pig through Romsey Town Square. Tickets for this joyous clash of coloured spandex and neon facepaint are available online from http://www.brightonrockers.com/ Bring your nan. Current training sessions are Tuesdays 7-9 p.m. (advanced), Wednesdays 7-9 p.m. (intermediate), Thursdays 7-9 p.m. (beginners), and Sundays 2-5 p.m. (all levels). All training is currently held at the Spandex Palace near the Newmarket Road roundabout. Email us at rollerbillies@gmail.com for directions and more information! Spandex gives you superpowers. Fact. It’s been a big 12 months in the life of UK derby: our first European tournament, a swathe of new leagues and new recruits, growing recognition for the sport, and blood, sweat and tears for the hundreds of women and men working to make it happen. 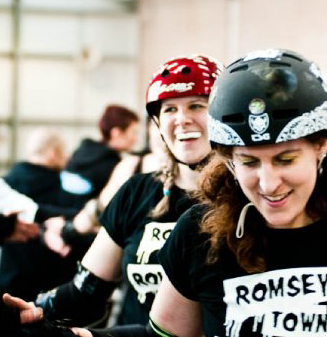 So when London Rollergirls announced that the Texas Rollergirls, originators of roller derby itself, were coming over to put on a bootcamp and play their travel team, London Brawling, it felt like UK derby was reaching a new level. LRG have spent the last four years inspiring, generously assisting, and ably dominating leagues across the UK. They’ve set the bar for the sport in Europe, easily defeating their closest European rivals by margins of two and three hundred points, so whilst the rest of us have been playing catch up with LRG, we wanted to know whether they would still be playing catch up with the rest of the world. Were they finally going to get their asses kicked? This was the game with the answers. The Texas Rollergirls, formed in 2003 and currently sitting in third spot in the DNN power rankings, looked ready to put their mark on the game. If there were spandex rankings in derby, and there should be, these women would surely win prizes. 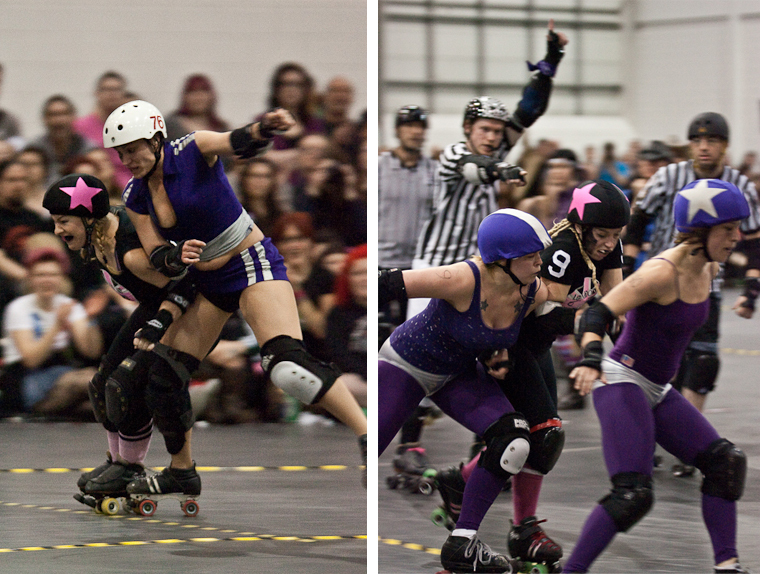 The Hustlers went straight to business with a power lineup in the first jam, but Acute Angel was swiftly sent off for a track cut, giving London’s Sky Rockit a surprise 10 point power jam and putting the Texans on the back foot. But it wasn’t long before Molotov M Pale took 10 points and equalized. As the Hustlers took a single point to lead, only to have Brawling take one back to re-equalise, a pattern began to emerge: both teams working their defense, delivering split-second call offs, and waiting. This was a game of very few, but very crucial, opportunities – and plenty of surprises. Neither side could hang onto the lead for long: when Stefanie Mainey, jamming for Brawling, was sent to the box, Molotov seized her moment to snag a 10 point lead for the Hustlers, only to have Mainey storm out in the next jam to juke her way to another 10, evening the score again at 21-21. Both sides inched forward, tussling for a few points, right up until the final jam of the period when Molotov took a trip to the box and opened up another power jam for London. Sky Rockit hopped straight through the pack on the inside line to take lead, and the Brawling defense trapped Curvette to haul the pack back and force the Hustlers’ remaining blockers to overstretch. Sky sucked up an audacious minor track cut and cruised out of the jam 10 points up, bringing the half time score to 39-30 for London. Both teams brought a strong defense to the second period. Texas dominated the front of the pack, with Babe Ruthless frequently forming a relentless one woman wall of doom for London’s jammers. Another power jam saw them regain the lead by one point, only to have London grab it back again, and two nail biting jams later the box was getting busy and points were tied at 55-55. Then at 57-57! Then at 61-61! Ten minutes on the clock, The Final Countdown on the PA, and dancing on the jam line: this was the greatest game of roller derby we’d seen in our lives. The power ballads seemed to refuel the Texans, and they launched into the home straight determined to break the stalemate. Bloody Mary motored off the jam line, leaving Belle Starr to sweep in and take out Kamikaze Kitten. Mary breezed through the London defense to put the Hustlers into the lead by 4. Forced to play catch up, Brawling found themselves digging deep as their jammers’ minors caught up with them. 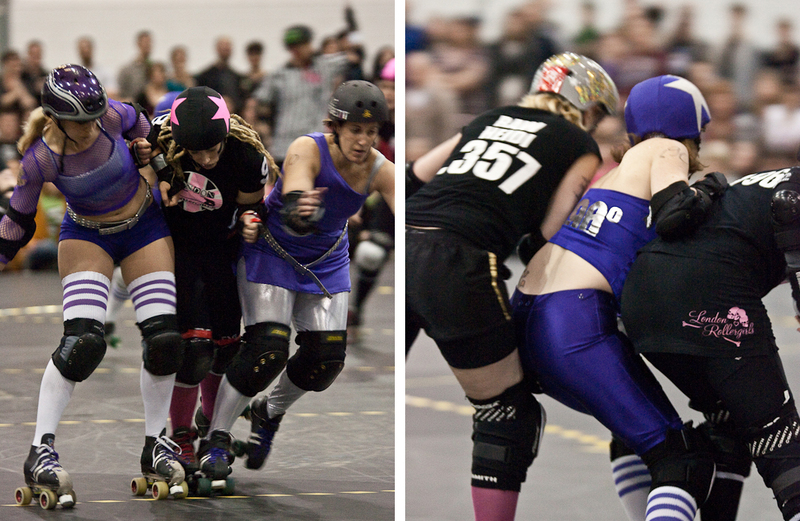 When the Hustlers got another power jam, the London pack managed to out sprint Bloody Mary, but when Axis of Evon was sent off, Texas lost no time corralling a gazelle, allowing Acute Angel to add a further 3 points to their lead and leaving London with their jammer in the box at the start of the final play. Not content with a mere 6 point lead, the Hustlers pulled out a truly monstrous 15 point final jam and sealed the score at a decisive 84-63. Verdict? Outstanding spandex. And a totally riveting game with standard setting play from both sides. We just haven’t seen a game as fast, close, and tactically demanding before. 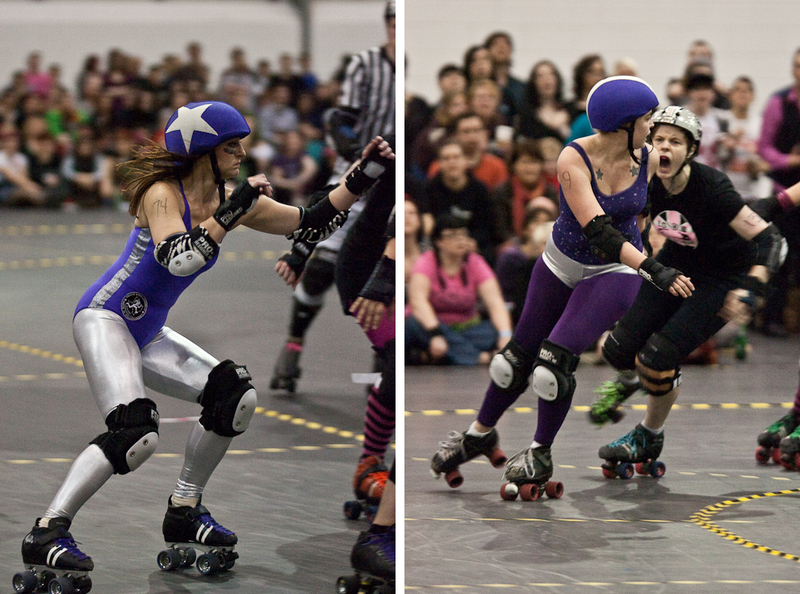 And we’ve finally seen LRG meet their match – and in the process play their best derby yet. Highlights? Two things: firstly it has to be the spandex. Secondly, you know how Mainey usually plays like it’s a pleasant stroll to the shops? And the reaction from the Rollerbillies? We are so getting leotards. Thank you to Hurt Reynolds and Justice Feelgood for letting me write this up for DNN, and thanks to Teshi Tailor for triumphing over the forces of high speed action to deliver these quality shots. * okay, possibly not in response to that exact question. The long overdue Love Smack writeup! In the great tradition of tardy Rollerbillies writeups, here’s the skinny on Love Smack. To kick it off, we are properly jealous of the Bombers‘ venue – a little bit chilly in February, but super spacious. There was even room for a romantic valentines balloon arch and a camper van. And all that space meant we had a wide selection of merch vendors to tempt us – including the all important cupcake stand. And not only cupcakes – bacon butties, eccles cakes, and a nice cup of tea. 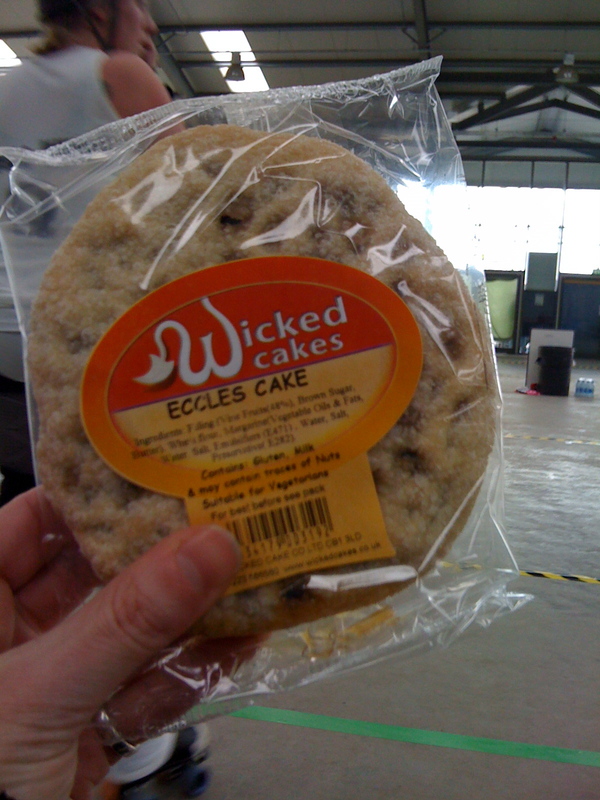 Oh yes, eccles cakes. Are we doing the roller derby workout challenge diet and eating cheese for breakfast? Uh, no. We’re growing enormous asses made of lard and raisins. Two B teams made up of women from teams all over the country. You could feel the excitement in the air as many of the skaters hit the track (sometimes literally) for the first time. All that training, all the hard work, and so much commitment, finally finding its expression in a momentous sweaty blur. Having never skated together before, both sides spent the first half finding their feet, and often finding their way to the penalty box, but by half time both teams were beginning to gel. The second half began with Team Black in possession of a 24 point lead, and Team White took to the track determined to close the gap. The pace increased as the period progressed, and a combination of solid three player defensive walls and a couple of textbook jams by Team White took them to within 4 points of equalising. Team Black were forced to play hard to retain their lead, and it all got a bit exciting and shouty, but ultimately the women in Black kept it together and finished on 155 points to team White’s 145. Bout two: Lincolnshire Bombers vs Central City: The Belles of Centrinnians made an impressive start, consistently taking lead and picking up 40 points to the Bombers’ 7 in the first eight jams. CCR’s jamming triangle of death, Hustle’her, Block Star, and Billie Whizz sliced past the Bombers’ front wall, whilst their blockers dominated in the pack and Tragic visited her wrath on the opposing jammers. The Bombers began to get into their stride as the first half progressed, picking up lead jammer with more frequency, but in the face of such assertive play they were stuck playing CCR’s game and finished the period with 30 points to the Centrinnians’ 65. But it’s always a different game in the second half and the Bombers came back on determined to set their own agenda. Ce Cee Slam’er, Inya Head and Minx a’matosis showed steely determination to grab lead, and with their blockers upping the energy on their hits they started raking some points back. But the Centrinnians’ jammers were tough to contain and shot out of the pack right behind the Bombers’, scoring hard on their heels and nomming into their points differential. It was a hard and pacey second period with much more competitive game play, but the Centrinnians had a selection of tricks up their armsocks, and maintained their cool and their advantage, ending the game with 130 to the hosts’ 79. “I was excited to be playing with people I’d never met before. I was also nervous about it. I worried I’d be the worst on the team and let everyone down and I worried it would be hard to get us working as a team as we wouldn’t know each other’s skate styles and strategies. The warm up was really fun and helped us get to know each other, and get a chance to try stuff out on the track. It was a pretty reasonable surface but for some reason plough stops were really tricky. Everyone was lovely – really friendly and a great laugh. It made me feel so much better. “I was SO nervous but was lucky enough to have Dusti by my side as a team-mate and that was really reassuring. I had met a few of the girls on both teams a few weeks before, at Rainy City’s bootcamp and knowing what I was coming up against helped relieve a LOT of the anxieties I had about my own skating ability. Team Black managed to get to know a bit about each other via a Facebook group – this really helped on the day & I think contributed a lot to the team working well together. Dusti and I lined up together on the first jam; by that point the anxieties had melted away and I was really raring to go!! I could see my family and RTRB team-mates on the front row cheering us on and desperately wanted to do them proud! The bout went by in a blur and I have NO idea how well I played, although found out that I should definitely not try jamming. Ever. What a disaster! But Dusti and I must have done something right as we played nearly every other jam and it felt amazing to work well with skaters I hardly knew. We tried really hard as a team to get the opportunity to push ourselves and try different positions and that worked really well. The two teams were put together well and we were pretty evenly matched – we had to work really hard to get our win! 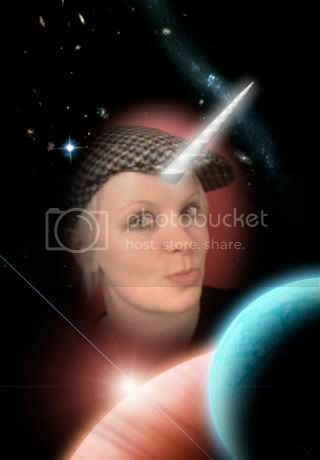 If you’re not already in the derby community, dear readers, this could be you! So far, the Rollerbillies have played one bout against Glasglow B, and our players have skated in our mixed side, Team East Angrier, against Stuttgart Valley Rollergirls and London Rollergirls. 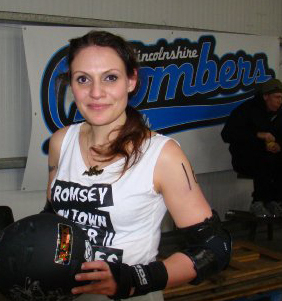 We’ve also guest skated for Central City and Bedfordshire Rollergirls, so we’ve got a mix of experience in the team. We’re always looking for new skaters and we’re committed to training them up right and giving them the opportunity to compete. There’s a bout out there for everyone, so what are you waiting for – come and check derby out for yourselves. Hit the I want in! page above to find out how. Thanks again to the Bombers for a great event, and for inviting our lovely Quad Ophelia to be your lineup manager. We’re really sorry we got the writeup out so late. Photo credits: Jason Ruffel (1), In Depth Photos (2, 3, 4, 7, 8 ) Hannah ‘H’annihilation‘ Edmonds (5), Daz Wilson (6), and Adam Rhoades (9, 10). One sleep til Love Smack! Tomorrow is bout day! 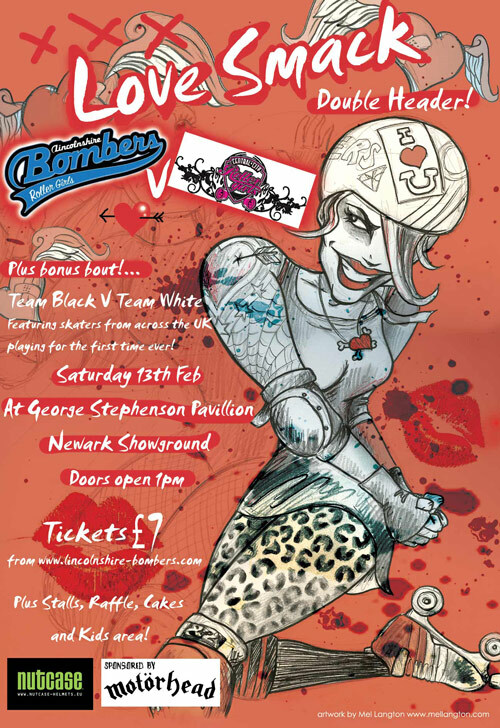 It’s time for Love Smack: another intense double header hosted by the Lincolnshire Bombers Rollergirls! 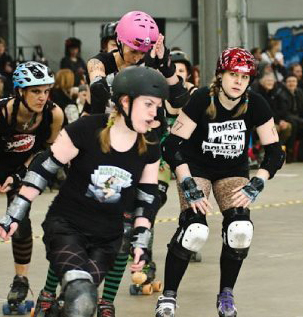 The first game will feature two B teams made up of women from eight different UK leagues (including the Rollerbillies!) and the second game will be the sartorially splendid Bombers versus the multitudinous might of Birmingham’s Central City Rollergirls. This is the second time LBRG have put on a mixed team event – the first showcasing not only some excellent women’s derby, but also featuring the first ever UK men’s derby bout – so this event promises to be a second feast of derby goodness. The Rollerbillies’ Dusti Knuckles, Phoenix in Flames, and Lil Mischief will be pitted against each other – Dusti and Phoenix on Team Black and Mischief on Team White, so.. GO EVERYONE! This is an exciting opportunity to see newer skaters getting their bout on, as well as another awesome instance of teams working together to build the UK derby community – what more could you want on a Saturday? Our own Quad Ophelia is lineup managing the Bombers, so she’s been checking out their super skills at practice. Central City scored a nail biting victory against Leeds Roller Dolls only two weeks ago, so we think this is going to be a killer game. Only one sleep to go! So get yourself down to the Newark Showground tomorrow and do some shouting with us! Or if you’re of a more Northerly persuasion, why not head over to Meadowbank Stadium in Edinburgh to see the Auld Reekie Rollergirls take on Leeds? 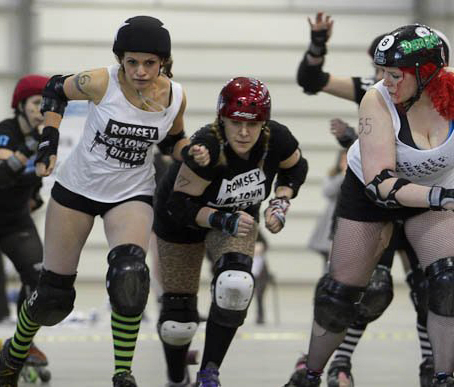 Or if you’re in Glasgow, check out Glasgow Rollergirls up against the London Rockin Rollers? These days we’ve got derby everywhere so there’s no reason to stay in watching Saturday Kitchen. Good luck to everyone skating this weekend, especially to those taking to the track for the first time – we’ll be rooting for you! May your wheels be swift and sufficiently grippy, your blocks devastatingly well timed, and your injuries minor. So, Hallowe’en saw the Rollerbillies’ inaugural bout… a quick ’support act’ style game with two periods of twenty minutes against the Maiden Grrders – Glasgow Rollergirls’ B team. I think I can safely speak for all the team when I say it was one of the most amazing days of our entire lives. A few of us were pretty nervous before hand… as the program said this time we had no gold spandex to protect us, and there were a lot of us who were still bout virgins, or hadn’t managed to get off the bench at Roll Britannia. 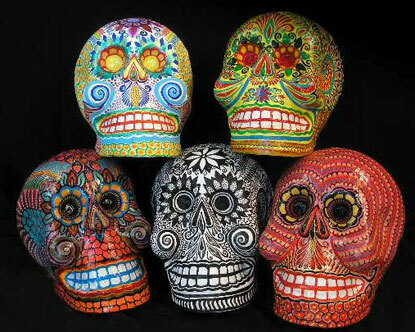 Still we donned our day of the dead makeup, and as soon as our skates hit the track the nerves calmed down, and the training took over. The fast period passed in a complete blur, feeling (to me at least) like any other scrimmage practice… only with more rest! We managed to keep the lead for the first half, albeit only by a fourteen point margin. At half time I was frantically texting our fallen comrade Voodoo Doily, and updating my facebook like the true internet addict I am. The fifteen minutes passed quickly, and I started to panic again when I realised that a. I had failed the kit check (my toe stops were loose, and I couldn’t find my tool! ), and b. we were still far far away from winning. I don’t know what words were shared amongst the Maiden Grrders, but they bounced back with a vengeance, and after an unluckily-timed trip to the penalty box, we were fighting tooth and nail (gum shield and wrist guard?) just to keep the points even. After some heart-stopping recounts, zebra huddles, and staring at the score board… the results were finally announced, Maiden Grrders 80 – Romsey Town 83!! We all screamed and cried, and leapt about nimbly on our skates in ways that we can’t usually manage without falling over. BLOODY HELL WE WON!! What an amazing day. Thank you so much GRG for making it all possible, and the Maiden Grrders for being such awesome opponents. You guys are all incredible. So now, it’s back to business as usual. Somehow I have to come up with some amazing training plans which will keep us up to scratch for the re-match. Eeek! Thanks also to all our wonderful NSOs, refs, and friends. aWeSoMe Wells and Jolly Green Genocide were line up mangers extraordinaires, and it was good to see a friendly face reffing in the forms of Captain Carnage and Juddernaut. And then of course there’s all our TEA mates, freshies, injured friends, and newbie refs back home who cheered us on with texts and calls. You guys all win. And lots of love and hugs to the LRG girls who came to watch, and left us feeling star struck by dancing with us at the afterparty. You are our heros and our inspiration. Like that? You can read more from Violet here. Thanks to Wullie Marr for the brilliant photos. Gin&Sonic on TEAM! EAST! ANGRIER!